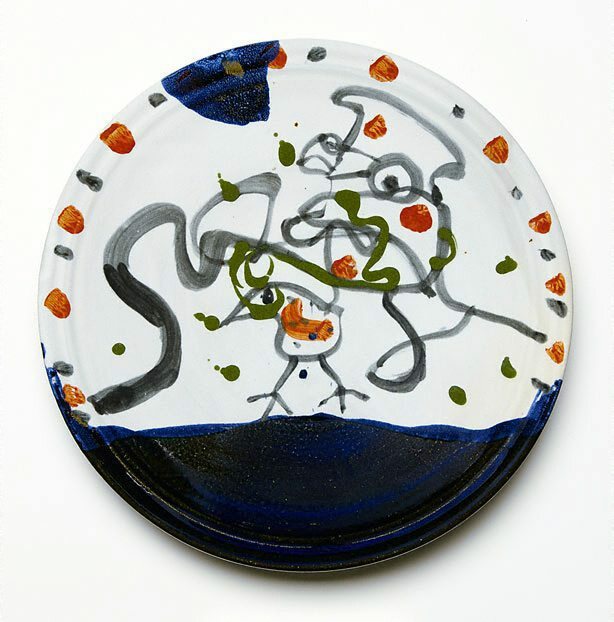 John Olsen was first introduced to the medium of painted ceramics in the late 1960s. Olsen and Robert Mair, a young potter who had arrived from New Zealand, were living near each other on the Dunmoochin Estate at Cottles Bridge near Hurstbridge, about 33 km north of Melbourne. The chance encounter of potter and artist produced a unique body of work over a period of two years, 1969-70, where Robert Mair produced a series of ceramic works, which were decorated by Olsen. The artist was stimulated by the possibilities of the calligraphic mark using glazes on earthenware, however, he was conscious of the difficulties faced with the unpredictability of the firing process. Olsen once wrote: 'I will allow the medium to speak on its own much more. I have found the glazes very unpredictable ... so one has to enter into the spirit of chance'. Over the ensuing years Olsen collaborated with a number of well-known ceramic artists, including Tom Sanders, Peter Wilson and, more recently Ros Auld, who crafted this plate. The striking forms produced by these potters coupled with the inventive designs created by Olsen, have made for a body of work which is often spontaneous, sometimes unconventional and certainly distinctive. Signed and dated on base of plate, black glaze "John/ Olsen 03".